The Haitian Roundtable has disclosed the selections for its 1804 List, recognizing Haitian-Americans in the United States who have demonstrated outstanding achievement and success in their profession, proven themselves to be forces for change in their communities, and who have helped to create a better understanding of Haiti and the Haitian community. The 1804 List, named in honor of Haiti’s year of independence, also recognizes outstanding Haitian-Americans as “Ones To Watch”, representing our community’s innovators and rising stars from a wide range of industries and backgrounds. 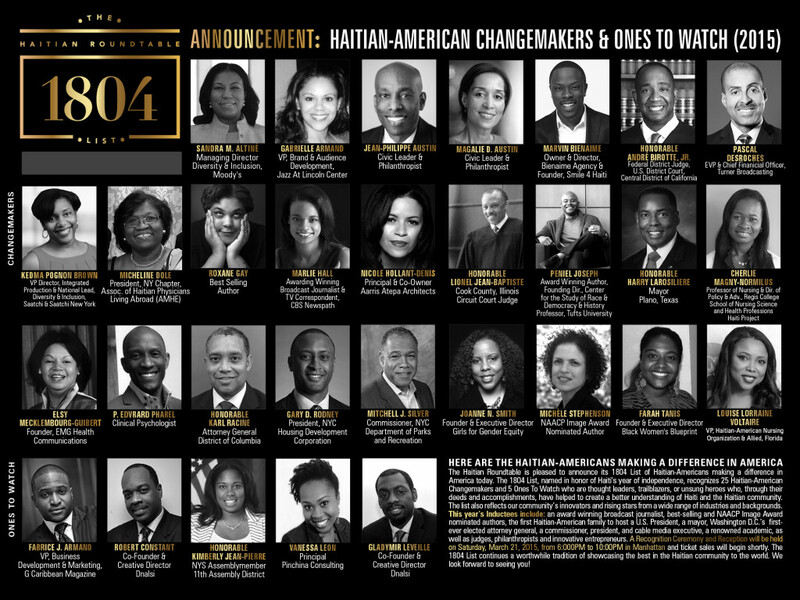 The 1804 List of 25 Haitian-American Changemakers and Ones To Watch for 2015 includes: an award winning broadcast journalist, best-selling authors, a filmmaker nominated for an NAACP Image Award, the first Haitian-American family to host a U.S. president, a mayor, Washington D.C.’s first elected attorney general, a federal district judge, a New York City commissioner, a cable executive, a renowned academic, as well as philanthropists and innovative entrepreneurs. A Recognition Ceremony and Reception will be held on Saturday, March 21, 2014, from 6:000PM to 10:00PM in New York City. Ticket sales will begin soon. The 1804 List continues a worthwhile tradition of showcasing the best in the Haitian community to the world. We look forward to seeing you! Pascal Desroches, Executive Vice President and CFO, Turner Broadcasting Inc.